After several leaks over the last week or so, LG tonight officially introduced the LG Q6. This is the first phone to be announced from its new Q-series mid-range lineup, offering premium features at a "competitive price." At its centerpiece is a FullVision display with an 18:9 aspect ratio surrounded by slim bezels and a sturdy frame made of 7000-series aluminum. Also, there is no "unsightly" camera bump at the back, as LG points out. But now comes the tricky part: there are three different variants of the LG Q6. All of them feature a 5.5-inch display with FHD+ resolution (1080 x 2160 pixels). Powering all is the Snapdragon 435 chipset, containing an octa-core CPU and the Adreno 505 GPU. But they differ in the amount of RAM and storage they ship with. The LG Q6+ offers 4GB of RAM with 64GB of native storage. It is available in Astro Black, Ice Platinum and Marine Blue. The LG Q6 comes with 3GB of RAM along with 32GB of native storage, and color options are Astro Black, Ice Platinum, Mystic White and Terra Gold. Lastly, the LG Q6a (stylized Q6α) comes with 2GB of RAM and 16GB of native storage. Colors available are Astro Black, Ice Platinum and Terra Gold. All three versions of the LG Q6 come with a 13MP rear-facing camera and a 5MP front-facing selfie shooter that takes wide angle shots at 100 degrees. The square camera mode lets you produce collages made up of multiple square images. 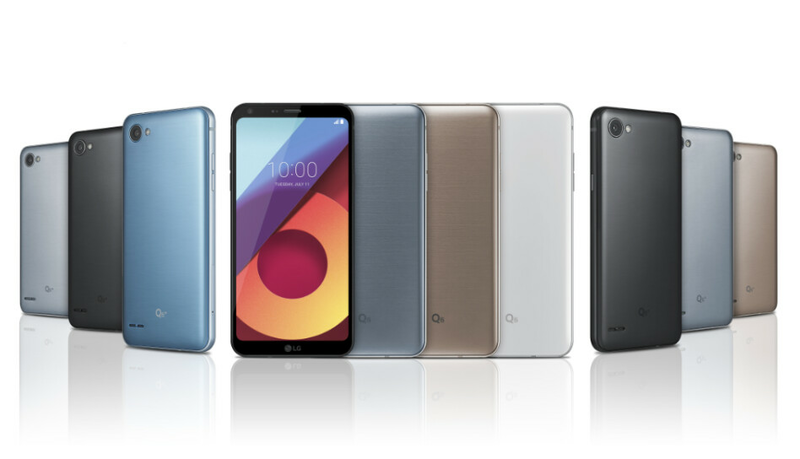 All three LG Q6 variants come with Android 7.1.1 pre-installed, along with LG's UX 6.0 interface featuring goodies like facial recognition system that quickly unlocks the device. A 3000mAh battery keeps the lights on, and LG highlights the fact that the cell in use has undergone rigorous safety checks. You will find the LG Q6 on sale in key Asian markets starting in August followed by releases in Europe, Latin America and North America. Pricing has yet to be announced, but it is safe to assume that the Q6+ would be the priciest of the bunch, while the Q6a would be most affordable. Glad that the processor is slightly better than rumored originally. It would be nice to try the regular Q6. This is one of those times where the rumor train was actually off by a good bit and kind of ruined any hype this device would've had. Snapdragon 435 vs the rumored 430. You can get it with 4GB of RAM and 64GB vs the max 3GB RAM rumored. 16 MP camera vs 13 MP camera rumored. It's actually a pretty well-rounded device, so long as the price is right. EDIT: It turns out PA may be wrong on the camera spec. Other sites are indeed listing it as 13 MP camera, not 16 MP. Can't find an official link to LG press release. We saw benchmark results for this phone's cpu. It's ruined. I've waited for it because of its size, but LG Mobile proved once again - they can waste any good idea - easily. This is gonna be expensive... why there's no fingerprint scanner? I'm not sure why they didn't say it here but on another site, they said that there's Facial Recognition on the top bezel, which takes the place of a fingerprint scanner. For the people late to the comment train, the article does say that facial recognition is there. I misread. Why can't LG out an inspiring design LG? That rear look like that of phones from more than half-a-decade ago. Bar the thicker base, Galaxy S2 of 2011 had a more appealing backside. Looking at that speaker grill made my inside shout meh. Even Chinese OEMs do better jobs at product designs. On the look department, the only thing this phone has going for it is its screen-to-body ratio. Even with their "competitive price", this would be a hardsell. A toughsell even in their homeland. Just my SUBJECTIVE opinion. Same with me. Unable to like. I get that same error message for trying to thumb up a comment. First the replies being misplaced. And now this. I wonder what the future holds for PA's comment system. But it's 5.5 for the size...not sure how any bigger would be possible.. When did the Snapdragon 435 become premium?? Seriously, no fingerprint scanner? I love the G6 and I think its one of the best of this year so far, but this, is just ridiculous..! No fingerprint scanner, and Snapdragon 435... This should be cheap enough if LG wants the Q6 to succeed. In what world is the snapdragon 435 mid range? What does that make the 625? High end? Why do these companies insist on making a million different variations of phones with hardly any differences -_- phones like these which will never get an update are half of the reason Android is so fragmented.